In work and in life, we’re bound to meet with frustrations, disappointments, losses. In our career, we might miss out on that promotion when it goes to someone who we feel is less deserving; we might write the exam for getting into med school and come up short on our first try. In life we might be out-bid on the house of our dreams or lose a loved one to divorce or death; we might struggle, repeatedly, to give up a bad habit. Resilience is the ability to experience these disappointments, frustrations and losses but take them in stride; it’s the ability to bounce back from failure and heartbreak. It’s what enables us to keep smiling in the face of adversity and keep trying, so that ultimately, we’ll succeed. Some people are naturally resilient. Some develop resilience. If you were lucky enough to be born with a resilient disposition, you’re probably a happy, successful individual. It doesn’t mean that you haven’t had your fair share of difficulties, but only that you’re able to “pick yourself up, brush yourself off and start all over again,” as the song says. Even if you weren’t born naturally resilient, you might still have learned this excellent life skill, or maybe not. Without resilience, you’re going to take each disappointment, frustration or loss really hard. You might eventually become despondent, hopeless or even angry after experiencing enough of these difficulties in life. Without resilience, people can become embittered, cynical, even overwhelmed. Without resilience, it’s that much harder to bounce back from the troubles you encounter in life or at work. People with less resilient personalities are less likely to be happy and successful, as they can get stopped dead in their tracks by adversity, whereas resilient folks take the hit but keep on going. So, how can you cultivate resilience? Resilience Tip #1 – Don’t take it personally when bad things happen to you. You don’t need to beat yourself up when things go wrong, and often, they have nothing to do with you, anyway. Face the fact that sometimes, bad things will happen, just because it’s a part of life. Adding self-criticism to the mix will only make it worse for you. Resilience Tip #2 – Do take responsibility for your part. While beating yourself up isn’t helpful, taking ownership for the choices you’ve been making is. When you recognize your role in the difficulties you’ve been experiencing, you have the power to change your behaviors for the better. This gives you a greater sense of control in your life. Resilience Tip #3 – Learn to self-soothe. It’s essential that you’re able to calm yourself down and reassure yourself that it’s going to be OK, and that you will get through this somehow. This ability will get you through the worst times. Resilience Tip #4 – Trust yourself; trust the world. When you believe in yourself and in your own ability to handle the challenges you’re facing, you won’t take them as hard as you otherwise would. When you see the world as basically an OK place, it’s easier for you to keep going when things aren’t going the way you’d like them to. 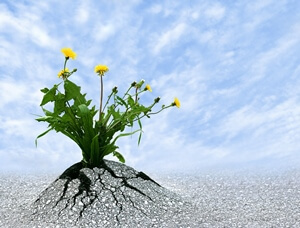 Resilience Tip #5 – Use adversity as opportunity for growth and personal/professional development. In other words, try to see the potential for lemonade in the lemons, or the silver lining around the dark storm clouds. If you can recognize the value (for growth and learning) in the hard times, they’ll never seem as daunting. Resilience Tip #6 – Be an optimist. Seeing the glass as half-full gives you hope, which makes you feel that it’s not always going to be this bad. Recognizing that the future can and will be brighter will enable you to bear the gloomy present. Resilience Tip #7 – Be persistent. Don’t give up (except when you really need to let go). When you try, try and try again, you’re much more likely to find a solution to your problem, and to feel empowered in your life. Then, when faced with another seemingly insurmountable difficulty, you’ll feel confident that you can meet this challenge, as well. Resilience Tip #8 – Don’t hold grudges. Forgive when you can, and let go when you can’t forgive. Holding on to anger, resentment or righteous indignation is poisonous to your spirit and makes it harder to come back from a setback. Self-care includes good nutrition, exercise, rest, sleep, meditation (or prayer), making time for enjoyable and meaningful activities and most importantly, getting support from your loved ones. Being in good physical, emotional and spiritual health makes it easier to be resilient when facing difficulties. Resilience Tip #10 – Accept that life is a balance of good times and hard times. When your expectations are realistic, you won’t be devastated when things take a turn for the worse. See your personal and professional life as a series of ups and downs, and recognize that while you can’t prevent all the difficulties you’re likely to face, you can deal effectively with many of them. Resilience Tip #11 – Have perspective. While you can’t always choose what happens to you (or to your loved ones, or to your company) you can always choose how you deal with adversity. Having a good sense of humor helps a lot with this. Also, knowing that sometimes bad things just happen will help you to feel less helpless, guilty or ashamed; knowing that you always have a choice in how you cope makes you feel less like a victim in life. Resilience Tip #12 – Be a warrior. When faced with adversity, you can fall to pieces or rise to the occasion. When you choose to stand and fight, you’ll always feel better, even if your best attempts ultimately fail. You should know, however, that even if things don’t go the way you would have wanted them to, you’ll never be a failure if at least you’ve given it your best shot in trying to find a solution to your problem. So, these are my twelve tips for cultivating resilience. Can you think of any others? Dr. Marcia Sirota is a Toronto-based board certified psychiatrist specializing in the treatment of trauma and addiction, as well as founder of the Ruthless Compassion Institute, whose mandate is to promote the philosophy of Ruthless Compassion and in so doing, improve the lives of people, everywhere.